Big day for me today. I got some advice on my book. I thought it would be interesting to post that advice, and now I’m feeling a little funny about including the praise portion of this email, as if I were showing off. But it’s part of the process that I’m documenting, and I’ve shown enough of the ugly on this blog, so, what the hell. I deserve the upside too. So I’ve been on hiatus the last month and waiting anxiously to hear from him, which I did today. I’m excited and anxious about what he has to say here. I’ll wait to say more about that until after I meet with him later this week and come up with an action plan for how to proceed. Note: The ellipses are to cut out detailed references to the plot and some personal notes. This book is beautifully written. The sentences and the overall craft are enviable and a lot of the language is breathtaking. Your use of simile is excellent. So much to admire about the writing. The dialogue, the characterization, the handling of scene, the detail. This is very fine writing with a naturalness and seeming effortless that are impressive. Your rendering of A___’s consciousness and “growth” through this cauldron . . . is the hallmark of the novel. You really have something special in the way you’ve developed this kid, and your use of third-person limited works perfectly. . . . His maturation is obviously the center of the story, and I never doubt him as a character for a second. He starts off as a boy afraid of . . ., sees himself make a nasty but necessary . . . , and finally . . . at the end. Along the way is one remarkable development after another, A____’s head and heart laid open to show the reader his desires, his choices, his pain. He is a great character. The book’s main relationship is the sort of pseudo-marriage between A____ and B____. I also understand her completely, understand how she’s trapped and afraid and why . . . . She doesn’t develop as much as A____, and yet she remains compelling and completely credible. You have a gift for exchanges between people, and I never once doubt any of B_____’s interactions with other characters, and marvel at how dead-on, true and unsentimental they are. In fact, all these characters have their own voices, and I can’t recall a single scene where the dialogue was predictable or where it didn’t reveal more about the people. Honestly, it’s such a long manuscript that I find myself somewhat at a loss to speak more specifically in this email, so I mainly want to say that you show real talent and vision as a writer and that this is a really fine, complete novel draft. As is, it works as a book, and you’re going to have to decide what kind of book you want it to be as you move forward. I’ve made some notes on the ms. that we can look at together, but those notes, like the things I’m going to say here, are macro responses. The book, even though it all holds together and continues to move forward even at its slowest, is a typical first novel in that it seems like everything you know about A____ growing up is in here. Much of that information is rich and informative; however, much of it, to me, slows the book and weakens the focus. The first chapter has examples of the main thing I would like to see you think about, and that is what exposition is necessary. The answer to this may be “all of it,” but another way of answering this question is to begin with “What is the story?” For me, that answer begins with A____’s maturation in . . ., and that narrative can’t ever be neglected or diluted by side info, nor can any element of it be repeated in the sense that you show something about A____ that’s already been shown. The events will be similar, of course, but their effect on him must be different. This is A____’s story. Another way to think about what’s essential is to consider the hierarchy of narratives, conflicts, and relationships, and decide what’s essential to serving and forwarding A____’s story. Right now they rank as A___ and B____, A____ and C____, and A____ and D____ a distant and under-developed third. Looking at the book in this way can also tell you if others’ POVs are necessary, no matter how well they’re handled, and E______’s especially is outstanding. On to the expected point. D____’s development. Until very late in the book, there is almost none. For some people this might work because his actions are villainous and reprehensible, but for me it reads as a flat character or avoidance by you. There are many opportunities along the way to see and hear D____ in scenes (as he is late in the book) and to make him more nuanced, more conflicted, more desperate, more complex. I think it’s essential that you develop him and consider him as a person in the same way you do your other characters. All of these things lead then to how to sustain momentum and build to the bone quivering, nauseating climax of the book. As much as it’s going to make you quake, I think the book could conceivably be reduced to half. That’s extreme, and that’s probably a book that also compresses the time frame a bit and drops anyone’s but A____’s POV, but if you’re willing to sacrifice a lot of really fine writing and a lot of detailed, well-crafted background, you can have a book that moves at a lean pace and still develops its central characters. Granted, that’s a very different book. You’d asked me a long time ago about childhood and teen third person narratives and there are the two novels by Tony Earley that are both big splashes, although I haven’t read them. I wonder if you may want to reread Tobias Wolff’s “This Boy’s Life,” too (assuming you’ve already read it) for pace and spareness. You should be really proud of what you’ve done so far, even though I know from experience and the present that the work ahead is daunting. Still on a break from writing. I'm reading War and Peace for the first time, through steady daily effort since Christmas when I got the new Pevear translation as a gift from my sister-in-law. I'm "almost done" in percentage terms, which is to say, I have about the equivalent of a regular novel to go. I can't get off my James Wood kick. Now, I'm really aggravated at his poke at the Young Turks for the quality that he calls "hysterical realism." There may be some categorical flaw in the kind of literature they are producing--in fact I don't like a lot of it myself--but the quality that he defines as "hysterical realism" isn't it, and it's not new. There is nothing in his description of that quality that doesn't apply perfectly to War and Peace, and in that case it works. The long passages where he quotes and argues with historians, departing from the narrative of his characters . . . it's exactly the same thing that Wallace, Zadie Smith, etc. do that Wood takes issue with. Again, I can't help reading Wood's analysis as a resentful middle-age crank trying to take the next generation down a peg simply because they are the next generation. I'm in a holding pattern for now. 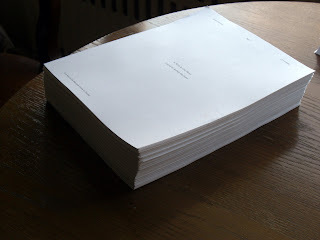 I've printed the complete typescript for the first time (550 pp.) and handed it off to my friend for the first complete reading by anyone other than my wife. Hopefully I'll hear back from him before too many weeks, and then I'll start whatever the next stage is.